Ideal for small families and close groups of friends, this home for six offers a great opportunity to explore the mountains of Central California. Go on summer hikes or wintertime ski trips, or kick back on your deck for a fun cookout - it's up to you! 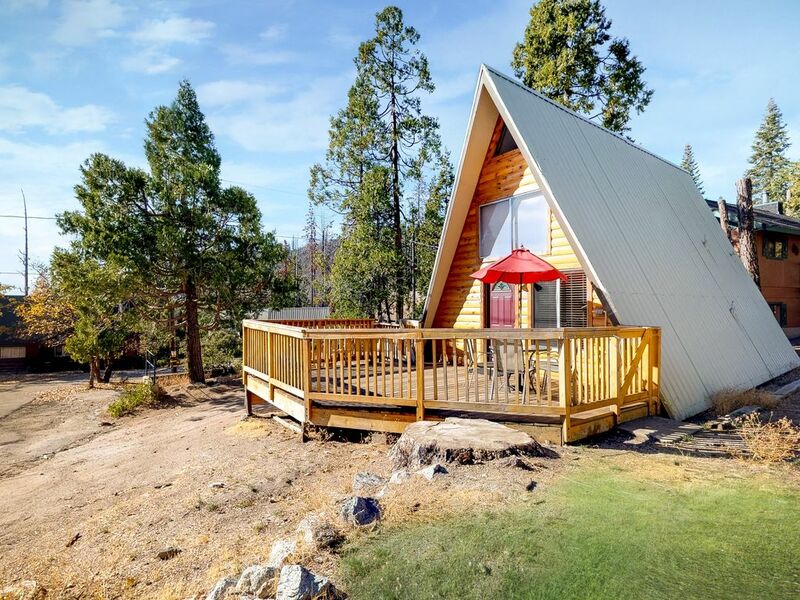 Nestled in the community of Shaver Lake, this cabin is only a short walk from shopping and dining in the nearby village. Grab some breakfast at the Blue Sky Cafe before heading to nearby Shaver Lake for swimming, where you can picnic at the shore for a tasty lunch. Explore the Sierra National Forest during the summertime, while China Peak Mountain Resort lets you ski during the wintertime. Whenever you plan your trip, you'll be sure to love this cozy cabin. A spacious deck with a grill lets you end each day with barbecues. And the kitchen inside is also well equipped for whipping up tasty meals and side dishes. Have relaxing movie nights by the woodstove, thanks to the flatscreen cable TV. When you're ready for bed, the downstairs room and accommodations in the loft ensure everyone will have a good night's sleep. Get started on your next Shaver Lake vacation now. Save your dates today! Parking Notes: Three cars can fit in the driveway surrounding the property. No parking on the street during winter months due to snow removal. No recreational vehicles or camping allowed in yards and driveways. Boat & Trailer Parking is only allowed in West Village & East Village. We recommend that all guests utilize Sierra Marina for a wet slip and/or trailer parking. Close to the town and shops etc. The chalet is looking a bit tired and could do with a re-vamp. However everything works, it's warm, there is a big log burner and comfy beds. It was a cozy getaway for a few days. A few downfalls though. Some dishes weren't fully clean so we had to clean the coffee stains and other food particles off before use. The fireplace wasn't cleaned out from previous use and there was no designated spot or bucket to put ashes. If you stay more than one day, there isn't a destination spot for bags of trash like an outside can so we had to pile it somewhere in the house. The stairs going to the loft is narrow, so don't recommend children going up alone or if you have problems with stairs. They do provide plenty of towels and other amenities. The satelittle tv was nice to have to keep the kiddo entertained and the men got to watch their football. Besides the few hiccups we dealt with, it was an overall nice stay especially for the money compared to other cabins and the location to town and the lake. We are sorry to see this stay had a few hiccups. We apologize for missing getting the fireplace ready for the cooler weather. We have followed-up with housekeeping about checking the dishes. Thank you! We were completely freaked out. I will never rent from this company again. They do have one outstanding employee, Nick Rogers, who was very helpful in replacing the broken DirecTV box (which was supposed to have been fixed prior to our arrival), and brought us a new toaster to replace the broken one. It was one thing after another. Won't stay again. We are disappointed to read this review and apologize for the issues this guest had. We would have replaced the broken items prior to this guest coming if we had been aware of their state. No one entered this guest's home since we have no staff in this area during the evening. The items they found in the morning were placed there the day before by housekeeping. Thank you! An older, but Cozy cabin, close to town. It was clean and a cozy cabin. Perfect for 6. It had everything listed and pictured, as described. The only thing I can say is.... it was missing the red umbrella out on the deck, it would of helped (during card game) to shield us from the afternoon sun, despite that, Our fam-bam had an awesome time! We would definitely come back and stay again!!! We had an issue when we first arrived with getting in working with the lock code, but the managers were fairly prompt and didn't have to wait too long. Looks quaint on the outside but very dated inside. There were raised screws on the stair way and someone gashed his foot on them. Be aware, there was no air conditioning and it was very hot even with the fans. Sat outside one evening when it cooled off and grabbed a blanket and it was pretty ripped up. It suited our purpose for a couple of days but wouldn't rent again. Note: At the top of this review it has a heart with "Loved It" and another option "Not Really". Couldn't change option to "Not Really"
We apologize for the malfunction with the lock; this does happen sometimes, and we do our best to address it quickly when it does. We have fixed the loose nails and removed the ripped blanket. We hope to see our guest again. Thank you! It was good to be so close to the town, walking distance.